One of my very favorite things to hear back from people is when I post an art project for kids, and they’re all: I WANT TO MAKE THIS, TOO. Which obviously is not allowed. Who every heard of adults having as much creative fun as kids? Pfft. Back to your cubicle! 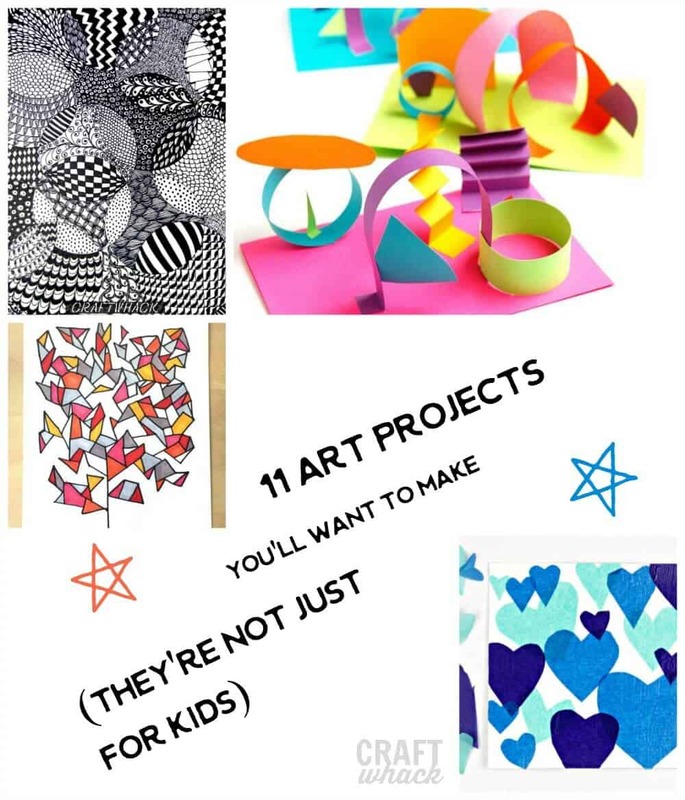 Hopefully you’ve ignored that missive and headed on over to your crafty art bins where you’ve pulled out every single art supply you own, because here are 11 easy art projects for kids that you will want to make too. And I know you already know what a bonding experience it is to make art with kids. You end up chatting, sharing, inspiring each other with your creations. It’s like a veritable positive vibes explosion. 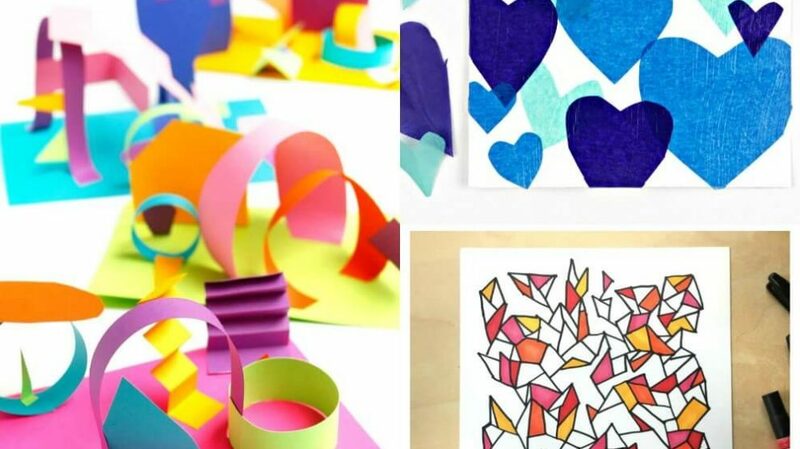 Tissue Collage – These are made with hearts, but, duh, you can cut any shapes out that you want. Try circles! Dots R Cool. 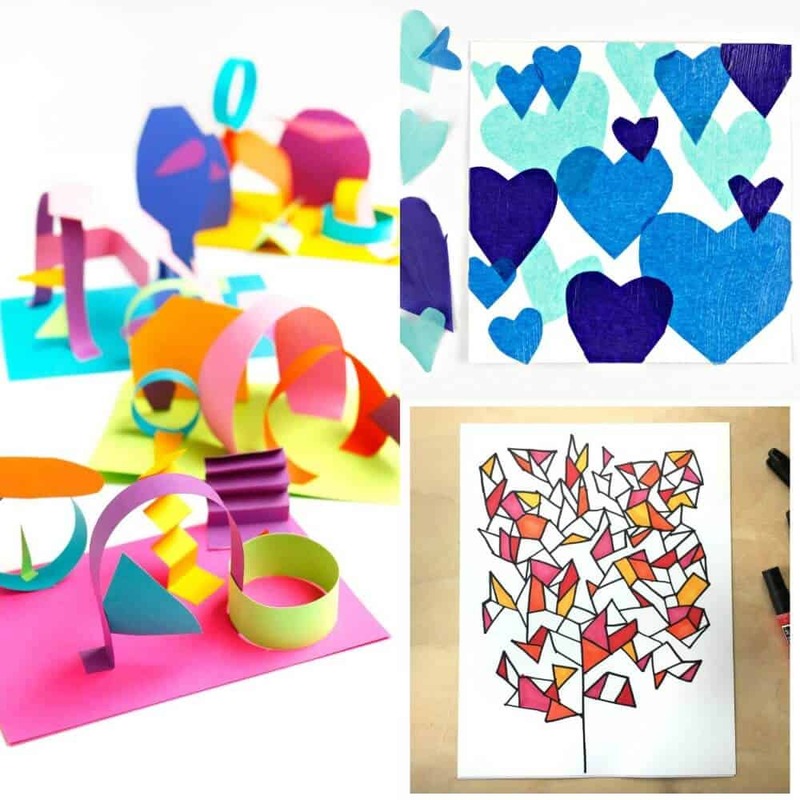 Colored Card Stock Paper Sculptures – These are easy to spend a whole afternoon making, especially if you cut out a bunch of really fun, bright colored shapes ahead of time and have piles to choose from. I come back to drawing this cool tree on a regular basis. There is something so meditative and satisfying about it, and I get positively teary when people share all the cool ways their kids have turned this project into their own. Please don’t tell me you just threw away 5 years worth of old fashion magazines. This magazine collage project brings out the most wonderfully surreal side in everybody. We always try to make them as creepy and hilarious as we can. Blind contour drawing may be an obvious one, but sometimes you need a reminder to do the classics. You will definitely enjoy doing this as much as the kids do. Um, yes. Blowing inky bubble prints is where it’s at, my people. You don’t even need to turn these into a sketchbook as I did in this project; it’s totally okay with me if you just make prints, or draw on them after they’ve dried. You will all have a ball making these. Printmaking is always a hit with kids and adults alike. The fun thing about this project is that you are making your printmaking plate by arranging cool foam stickers, and then you can print with it. Another super fun art activity to do together is shadow drawing. Make sure you have a bunch of great marker colors, and some toys with good shapes, and you’ll be making the coolest-looking drawings ever. I seriously do not think you can have more fun with crayons and paper than this transfer project. It takes a little bit of time to get all the colors down, but I love that sort of mindless coloring. As wonderful as it looks, this tape resist flower painting is super easy to make, so grab your paints and blue tape and head on over for the instructions. Zentangle! 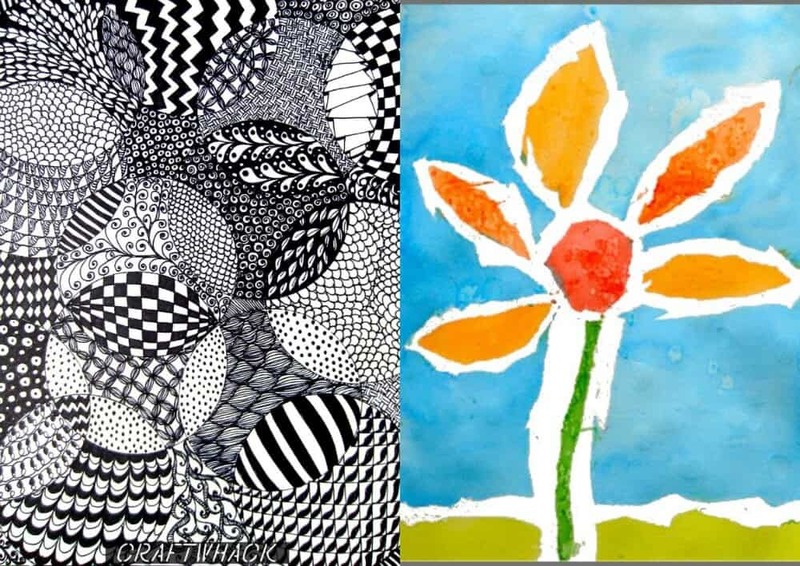 This doodly drawing technique has taken the world by storm, and my tangle projects are some of the most popular on this site. Especially since I stray from official Zentangle and make up my own rules, i.e. there are no rules, just doodle.